Labor Day always marks the end of summer for me, and probably most people at that. This weekend in St. Louis for field hockey was so fun and incredibly hot. Over 100 degree weather for three days straight (and even higher temps on the turf field) was just what I needed to feel satisfied with summer weather and ready for fall. Being a senior in high school comes with a bit of a nostalgic side to it, so in honor of this final year, I want to make a little bucket list to make sure I make the most out of the time I have left with my friends here at home! Last year apple picking and a haunted house were some of the highlights of fall for me. This year, I want to recreate some of those memories in addition to a few more! I will be getting another French exchange student this year, but this time a boy, and I think it would be so fun to go for a hike somewhere when the leaves are changing. Love your list! 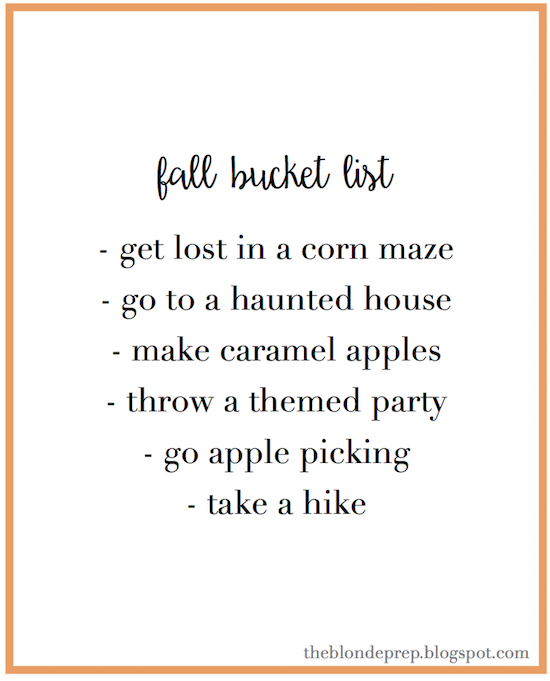 On the bucket list is a nighttime corn maze with friends and baking all my favorite pumpkin recipes!